Danny vs. the internet: Nessa? Blog about things I find interesting, or incredibly stupid. Mostly its to make fun of other people, post links I find funny and lower the amount of crap I post elsewhere - email me, feel free to comment and please click an ad from time to time! A woman in Cardiff, Wales went absolutely batsh*t when a cake shoppe (that's how they spell it in Britain right?) sold out of her favorite cupcake. When having a bad day it can take just the tiniest incident to tip you over the edge - but this woman's fit of rage really takes the cake. 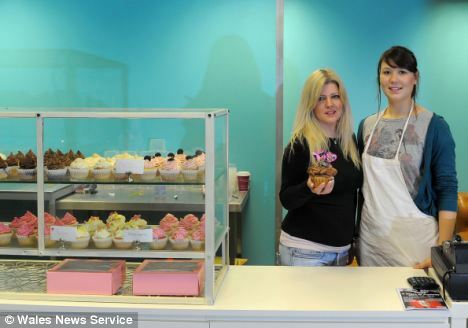 A mother trashed a cake shop after being told they had run out of her favourite flavour of cupcake. With her children beside her, she smashed glass display units and threw cupcakes at customers after being told there were no more 'sweet tooth fairy cakes'. She even attacked members of staff in her fit of rage. Her reaction was so swift and dramatic, she did not even give staff time to tell her they could simply bake a fresh batch. Is that one of 500?! Seriously, how does this guy still have a career? The Fukushima 50: "Not afraid to die"
I'm only trying to increase heart health! "To you I say... F--- off"
Guard duck, can we hang out? Simple theme. Theme images by mayo5. Powered by Blogger.